Single-family homeowners in Rock Island County pay an average property tax bill above $2,800, according to a new report. It’s no secret that Illinois is home to some of the highest property taxes in the nation. But in Rock Island County, homeowners are paying higher property taxes than the state average and more than double the national average, when measured as a share of home value. That’s according to new data released in April by ATTOM Data Solutions, a housing data company. The average property tax bill for a single-family homeowner in Rock Island County was $2,855 in 2017, according to ATTOM. With the average home value estimated at just under $111,700, that bill brings the average effective property tax rate up to 2.56 percent. Neighboring Henry County saw a nearly identical rate of 2.55 percent. Both are more than double the national average of 1.17 percent. They’re also higher than the state average of 2.22 percent, according to ATTOM. Just like the state as a whole, Rock Island County has had difficulties attracting and retaining residents in recent years. Might a heavy property tax burden be putting up red flags? In the Quad Cities region, the Illinois side of the border is shrinking while the Iowa side is growing. 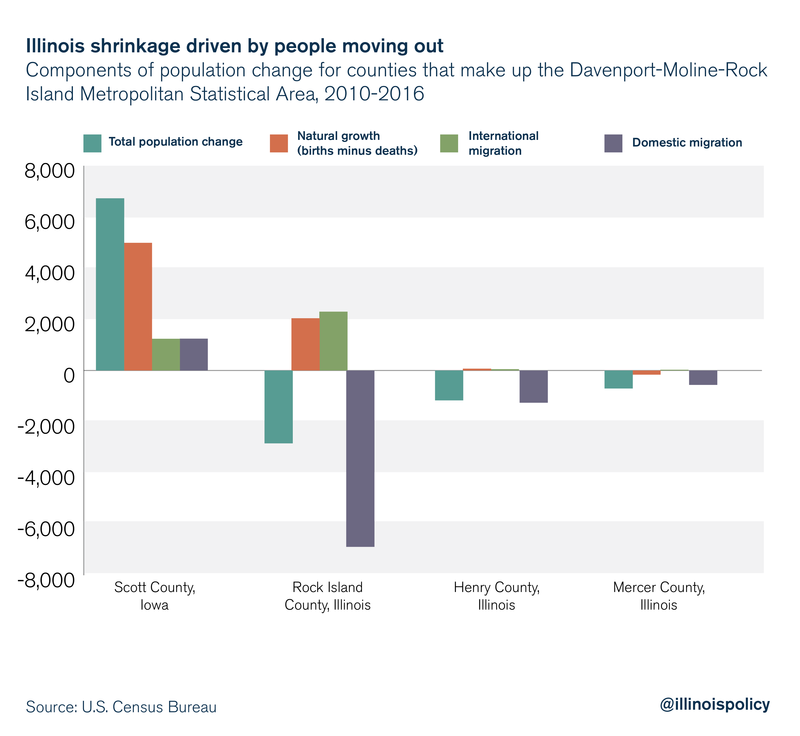 This divergence is driven mainly by Rock Island County’s heavy net loss of residents to other counties. Meanwhile, Iowa’s Scott County has seen a net gain of residents from other counties. The average effective property tax rate in Scott County is 1.64 percent, according to ATTOM – more than 35 percent lower than Rock Island County. This disparity in the effective property tax rate echoes earlier data from the U.S. Census Bureau. Consumer finance website WalletHub found in a 2018 report that when adjusting for cost of living, the median household in Iowa faced a lower total state and local tax burden than the median household in Illinois. Unfortunately, efforts to address the cost-drivers of those bills in Illinois have often been “hijacked” by those opposed to reform. In Henry County, for example, calls to study cost-saving measures among dozens of local governments have been muzzled repeatedly. Members of the General Assembly, meanwhile, have been unwilling to tackle a number of substantial reforms at the state level to reduce property tax bills. Iowa is moving ahead with reforms to ease tax burdens. The Hawkeye State changed its rules for government union collective bargaining in 2017, which will help control taxpayer costs. In Illinois, property taxes continue to rapidly spiral upward. Until Springfield takes smart steps toward making the Land of Lincoln more attractive for families and businesses, Quad Cities homeowners will continue to see lighter property tax burdens on the Iowa side of the Mississippi River.